Patchy reionization at redshift z=6.6 in the Tiamat Simulation, as modelled by Meraxes. 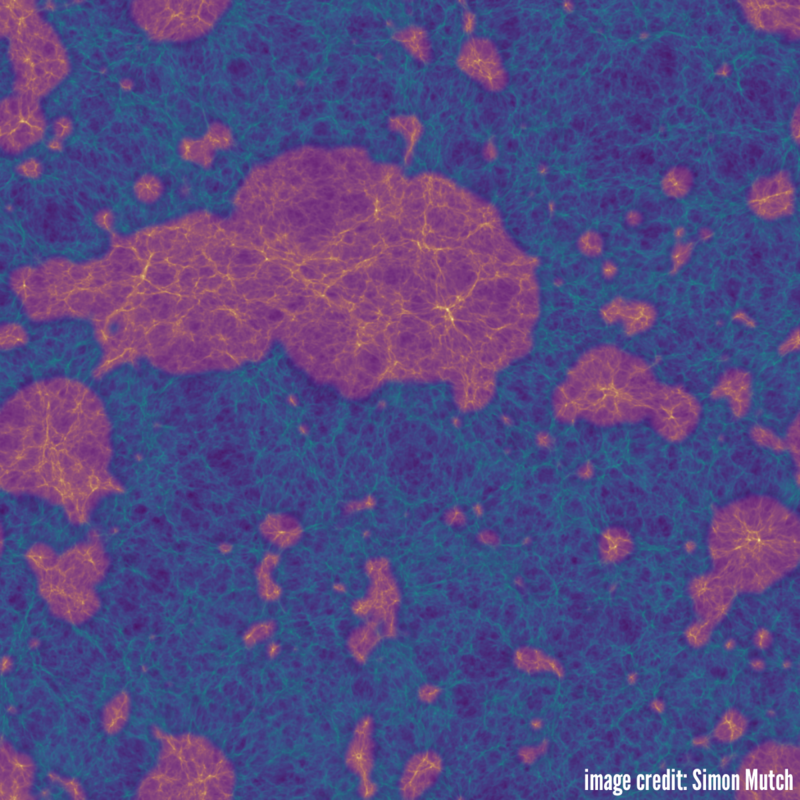 The exploration of galaxy formation in the Early Universe – when stars first began forming and galaxies first assembled into recognizable structures after the Big Bang – is an area of intense study across the globe. In particular, a competitive international race is currently underway to obtain the first observations revealing the Early Universe’s transition from being permeated by cool and neutral gas (the product of the Big Bang) to being filled with gas ionized by energetic light from the first stars: the so-called “Epoch of Reionization” (EoR). Using software support resources acquired under the 2017B semester of the ADACS Software Support scheme, Dr. Simon Mutch of the University of Melbourne has partnered with ADACS in the effort to supply accurate theoretical models capable of predicting the progression of this transition, and of interpreting these exciting observations once they become available. 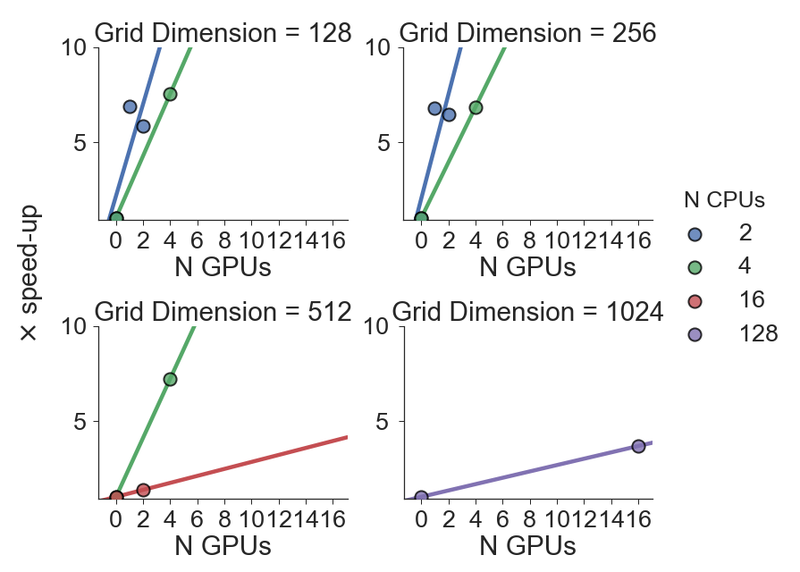 ADACS has enabled GPU acceleration for Meraxes: one of the most sophisticated theoretical models of the EoR available today (see links here for a detailed account). Under realistic loads for very large problem sizes, substantial speed-ups of 8X have been obtained (see figure for scaling results compiled with NVIDIA Tesla K10’s using CUDA 7.5). A version utilising cuFFT for small problem sizes (so that the entire calculation can be done on the GPU) has been developed as well, for which speed-ups of 168X have been obtained. This not only reduces the time to solution, but greatly increases the potential scope of investigations now possible with this fantastic tool. Simulations of higher resolution, larger volume and covering a larger range and sophistication of galaxy formation models can now be run. All development is planned to be released under the MIT license. Early access can be obtained by contacting Dr. Gregory Poole at gpoole@swin.edu.au. This work was performed on the swinSTAR supercomputer at Swinburne University of Technology. All development was conducted by Dr. Gregory Poole (ADACS – Swinburne).